Any personnel observing or interacting with SCP-718 for longer than the advised period must be removed, with force if necessary. Any personnel acting in an erratic or violent manner will be transferred. SCP-718's stare can induce discomfort and paranoia in a very short time, often resulting in a subject's attempt to destroy SCP-718. The eye, if damaged, will explode, showering clear fluid on all nearby surfaces before shriveling into powder. Anything the fluid touches will develop a clear blister-like bubble that slowly turns black. After twenty-four hours, the "blister" will burst, and a 20.32cm (8in) copy of SCP-718 will emerge, growing to full size over the course of a few days. This has been shown to occur on all organic surfaces, and many inorganic. If SCP-718 is not removed from a living subject, testing indicates that the subject becomes able to 'see' through SCP-718. 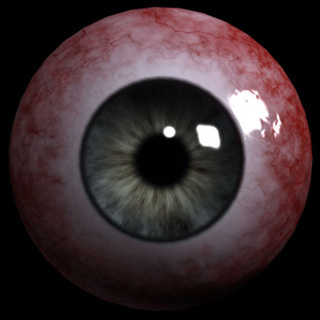 Vision with SCP-718 is different, as [DATA EXPUNGED] is now visible, at the expense of more conventional sight. This has an extremely detrimental effect on subjects, drastically lowering mental stability and often leading to suicide. The death of a host will cause SCP-718 to burst.